Meghan, Duchess of Sussex visitsAbel Tasman National Park, which sits at the north-Eastern tip of the South Island, to visit some of the conservation initiatives managed by the Department of Conservation on October 29, 2018 in Wellington, New Zealand. They arrived by military helicopters where they were greeted by Kaumatua, had lunch, and walked with Takaka Department of Conservation area manager Andrew Lamason along the golden sand beach. The day's events where cut short due to bad weather. The Duke and Duchess of Sussex are on their official 16-day Autumn tour visiting cities in Australia, Fiji, Tonga and New Zealand. 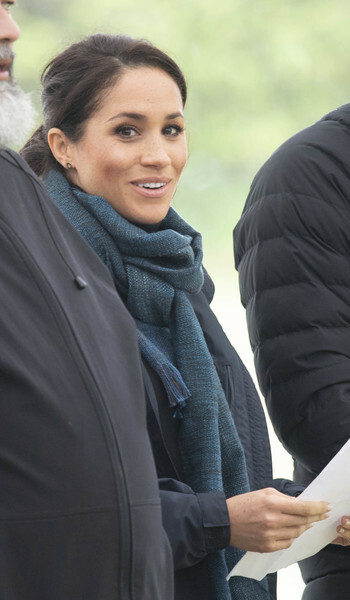 Meghan Markle stayed warm with a blue cashmere scarf by Loro Piana while visiting the Abel Tasman National Park in New Zealand.